The Olympic Park was all but deserted on the final day of the Sochi 2014 Olympic Games. There were only two events scheduled that day: Men’s Gold Medal Hockey and the Closing Ceremony. Only those with tickets to at least one of these events were permitted to enter the park. With Canada playing for GOLD there was a large Canadian presence. I went in early in search of epic Canadian Olympic fans and I found my first group at the first open concession cart buying beer (because a Canadian watching hockey without beer is just wrong!). Olympic Spirit Project Books and Postcards now available! Next I made my way to Canada Olympic House to see who had collected there to prep for the game and this guy walked up with a tray full of beers and started handing them out to fellow Canadians. Did I mention how much I love Canadians? Next, Shauna and I strolled toward the Bolshoy Arena and came across these Russian guys who unexpectedly swept me off my feet, and then we found more Canadians with flags and a crazy collection of signatures. Then there was a couple who almost didn’t make it to Sochi due to a leg injury, but they pushed through and made it, wheelchair and all! Well done guys! Talk about dedicated fans! YAY! I first met this OPB at the London 2012 Olympics where I got my first introduction to Olympic Party Boy awesomeness. Back in Vancouver, he had mentioned that he was having a custom Canada suit designed by Ash Turner of Mechanic Organic for the Sochi 2014, so I was excited to include it in the Olympic Spirit Project! He showed up for the Gold Medal Game wearing tailored white pants, a white suit jacket with red arms, “Canada” embroidered on the breast pocket and a giant maple leaf sewn on the back. (You did an phenomenal job Ash Turner!) He topped that off with a red t-shirt, red and white Adidas sneakers and a maple leaf pin on the lapel. Don’t get me wrong, everyone else looked awesome too with their jerseys, face paint, helmets and flags, but what made this so epic was the originality and the fact that this super classy suit is one of a kind. It just doesn’t get cooler than that! Complete AWESOMENESS! 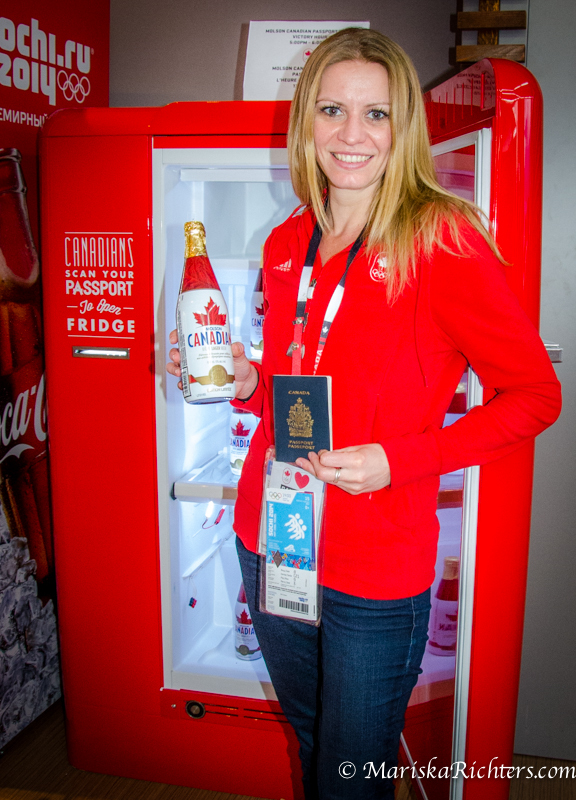 How did you show your Olympic Spirit during the Games? Olympic Spirit Project BOOKS are now available in Print, ePub and PDF!